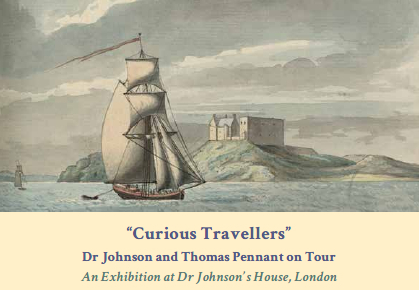 On Friday, 5 October, a new exhibition, ‘Curious Travellers’: Dr Johnson and Thomas Pennant on Tour’ , opens at Dr Johnson’s House in London. Organized as part of the four-year AHRC-funded research project Curious Travellers, this display explores the journeys and writings of — and investigates the complex links between — two of the most renowned eighteenth-century travel writers: the Welsh naturalist Thomas Pennant (1726–98) and the English author and lexicographer Samuel Johnson (1709–84). With the aid of contemporary maps and travel books, the fascinating exhibition examines and charts these authors’ accounts of Scotland and Wales, and considers the responses from their contemporary readers to the published Tours. 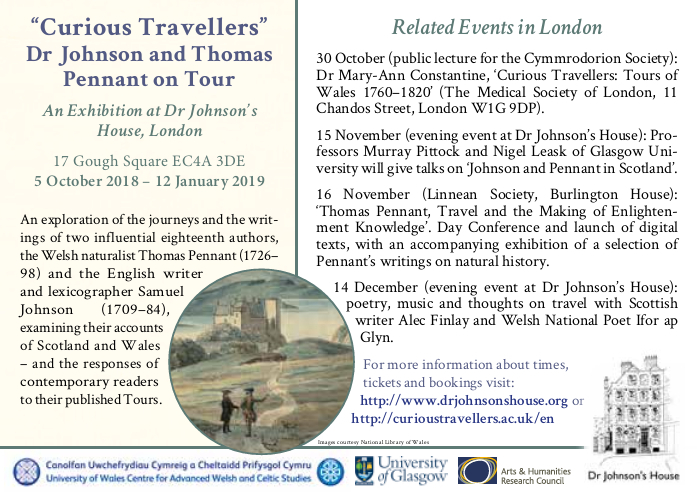 In addition to this exhibition on the two men’s journeys and travel writing, Curious Travellers, which is nearing the conclusion of its work, will be hosting a final conference, Thomas Pennant, Travel and the Making of Enlightenment Knowledge, on 15 November at the Linnean Society, London. Further information about the event will be provided on this blog in a forthcoming post. Meanwhile, in another strand of their work, and in partnership with EMLO, Curious Travellers is in the process of preparing and uploading into the union catalogue an inventory of the correspondence of Thomas Pennant, and progress of this catalogue may be followed on the introductory page. Dr Johnson’s House, at 17 Gough Square, may be found tucked within the historic cluster of streets and alleyways to the north of Fleet Street and the east of Fetter Lane. Built at the end of the seventeenth century by the merchant and member of Parliament for Bramber, Sussex, Richard Gough (1655–1728), it is the sole house from this period to survive in the square. Johnson lived as a tenant on the premises with his wife Elizabeth (and presumably ‘a very fine cat’ or two). It was here in the attic rooms that he worked on and saw through to publication his renowned A Dictionary of the English Language (1755). Following the death of his wife in 1752, Johnson’s household expanded to include the infamous ‘strange cast of derelicts and waifs’.2 He moved from Gough Square in 1759. This entry was posted in Uncategorized on September 28, 2018 by Miranda Lewis.